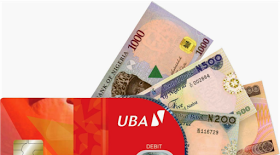 UBA account holders in Nigeria, you can now buy airtime from your bank account by using your mobile phones. Not only that, you can still recharge or buy credit for anybody through your own bank account. No restrictions to any network, as it can be done on MTN, Etisalat, Glo and Airtel lines. UBA made it so simple, easy and fast to use by all. This service saves you from stress of going out to buy recharge cards in order to call or to send the airtime to your loved ones. Read on below to see how to go about using this upgraded service. √ SEE ALSO: How To Recharge And Get Airtime From Diamond Bank Account Using MTN Via Your Phone. Always feel free to contribute by using the comment box below..